Barstow Truck Accident Injury Lawyers - Over Three Decades of Experience You Can Trust! Are You Looking for a Truck Collision or Car Accident Injury Attorney in Barstow, San Bernardino, California? When a truck accident in Barstow, California leaves you struggling with a devastating injury or the death of a loved one, the situation can be extremely distressing. Mounting medical bills, loss of income and uncertainty about the future can start to significantly affect your personal life. If you or your loved one has been involved in a truck accident in Barstow, or if you have a wrongful death claim due to death of a family member in a truck crash in Barstow, San Bernardino or anywhere in California, it is important that you contact an experienced truck accident injury lawyer and law firm for truck accident legal advice. For nearly four decades, our experienced and compassionate truck accident personal injury and wrongful death lawyers have successfully resolved thousands of cases and recovered more than $100,000,000.00 in funds for our clients. We help the victims of truck accidents, car collisions and other personal injury claims in Barstow and all of California pursue their rights and get maximum compensation for injuries, as well as for their economic losses and other damages. Please feel free to visit our Truck Injury Accident Web Site to learn more about the truck accident injury claim process and please call us for a FREE CONSULTATION and FREE CASE EVALUATION about the specific facts and circumstances of your case. The initial consultation and evaluation on truck and car accident claims is FREE and we work on a contingency fee – which means you pay us nothing until we WIN! Barstow is located in San Bernardino County, California. As per the 2010 United States Census, Barstow had a population of 22,639. Barstow is located 55 miles (89 km) north of the city of San Bernardino and is a major transportation center for the Inland Empire. Home to major highways, including Interstate 15 and Interstate 40, Barstow is subjected to heavy and fast traffic, resulting in bad truck, car and motorcycle accidents with serious injuries and fatalities. Over 40 Years of Truck Accident & Car Accident Experience You Can Trust in Barstow, San Bernardino and Throughout all of California! Vast experience in resolving personal injuries inflicted and wrongful death cases throughout Barstow, San Bernardino Orange, Los Angeles, the San Fernando Valley, Ventura and all of California. Resolved thousands of truck and other motor vehicle claims with a success rate in excess of 95%. Offer immediate assistance with medical attention, property damage repair and settlement, loan cars, medications, prescriptions, money advances when appropriate, etc. 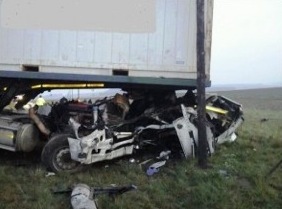 Most individuals are not aware of the compensation they are eligible for, in the event of a truck accident. As a personal injury law office handling truck, car, motorcycle and other personal injury accident claims in Barstow, San Bernardino, we have the necessary skills, resources and over 40 years of experience to handle truck accident personal injury and wrongful death claims. To learn about how we can assist you further, and what you need to do to protect your rights and other procedural rules and deadlines, and how we may help you do this without any charge until you win, please call us at 1-818-222-3400 or 1-866-INJURY 2 or 866-465-8792 (after hours, press 1) for a FREE, no-obligation consultation. Additionally, you can also email us at info@WalchLaw.com or fill our contact form, and find out about your options. FREE Consultation and NO Fee Until You WIN! Please call us now; you will be glad that you did!